Figure 8.74. Intestinal vascular anomaly in a 9 month old Labrador dog with vomiting and diarrhea. 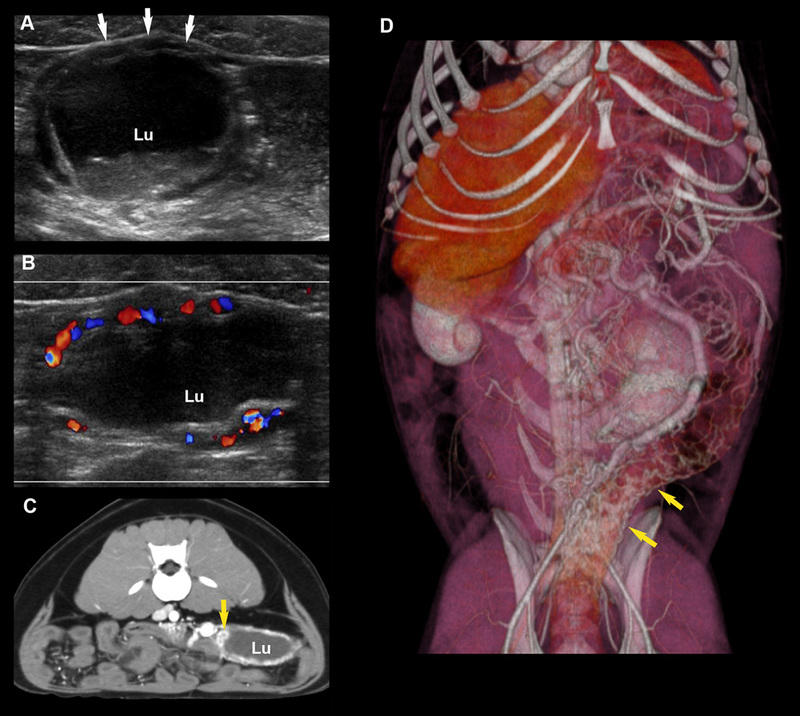 A and B: Transverse sonograms of one fluid filled colonic segment with a thickened, nodular-like wall made of intramural enlarged varices (arrows in A), as confirmed using color flow Doppler (in B). A large network of numerous anomalous small vessels was seen throughout the abdomen, especially in the mesentery and near the main portal vein. C: Transverse post-contrast CT image of the caudal abdomen showing the intramural colonic vessels (arrow). D: Reconstructed CT dorsal image illustrating the numerous anomalous enlarged and tortuous vessels supportive of portal hypertension and acquired portosystemic shunts. Note the intramural colonic vessels (arrows). The left side of the liver is nearly absent. Because of the guarded prognosis, the dog was euthanatized and the final diagnosis is arteriovenous malformation with marked arteriolar proliferation and hypertrophy, venous ectasia, lobular atrophy and fibrosis.